If there is one certain thing in space exploration it is that nature will always find new ways to surprise us. NASA's OSIRIS-REx mission was launched in 2016 and arrived at its target, the near-Earth carbonaceous asteroid Bennu in December 2018. One of the main goals for OSIRIS-REx is a sample return. A robotic arm and sampling system will be brought into contact with the asteroid's surface and if things go according to plan a sample will be stowed and brought back to Earth in 2023. But Bennu is already turning out to be a trickier and more interesting beast than perhaps expected. At just some 492 meters across it's a pretty small body, and OSIRIS-REx currently has the smallest orbit around Bennu of any space mission exploring a solar system body to date - at a mere 1.6 kilometers. Two observations from this close-in perspective stand out at this time. 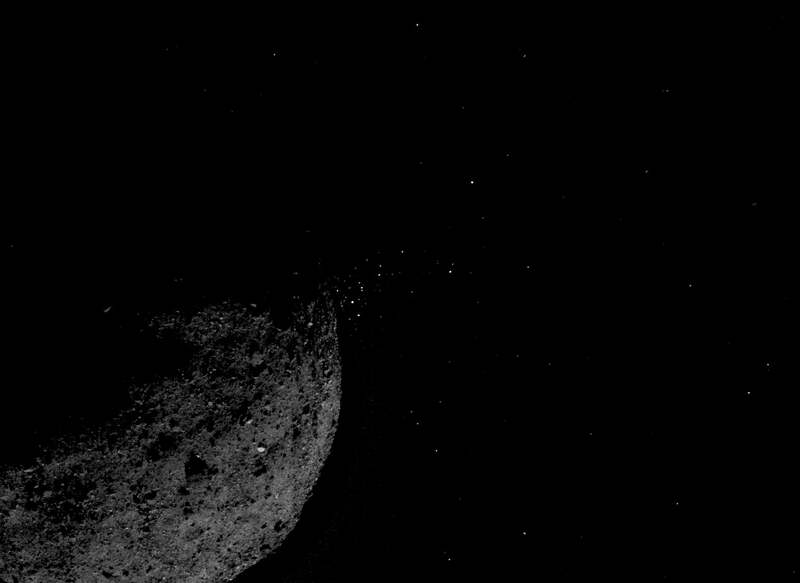 The first is that Bennu is extraordinarily rocky - its surface is littered with boulders, forming a rough and varied terrain that was not expected. This may prove challenging for the sample return 'touchdown' maneuver that requires a clear approach to finer grained material that can be captured. Eleven such events have been seen at this time. This places Bennu into a fairly elite club of 'active' asteroids - bodies that show evidence of ejection of material. Not all of the particles escape the asteroid, many seem likely to fall back after a period of being lofted up, implying that Bennu 'self-refreshes' its surface with pebbly matter. What's causing these spit ups? We don't know, but it seems plausible that it's connected with heating of Bennu during part of its orbit around the Sun. For the other active asteroids in the solar system the possibilities include: impact ejection and disruption, electrostatic repulsion, rotational instabilities, radiation pressure, dehydration stresses and thermal fracture, or even the boil-off (sublimation) of asteroidal ice. Studying this phenomenon close up is a unique, and unexpected, opportunity.